Dinosaurs and Indians: Paleontology Resource Dispossession from Sioux Lands by Lawrence W. Bradley argues that vertebrate fossils are yet another natural resource dispossessed from subjugated people like the Sioux of the Northern Great Plains of the USA. It begins with an introduction, the purpose of the study, its methodology and literature reviews, followed by the history of vertebrate fossil dispossession from the Great Sioux Reservation and adjacent Indian lands from 1847 to 1899, as well as from 1900 to the present. This dissertation in its conclusion will bring together the past, present, and future of paleontology on Indian lands of the Great Plains. The following questions are addressed: 1) Were the vast paleontological resources located on Indian lands of the Great Plains since the mid-nineteenth century used to advantage and by whom? 2) What is the volume and value of fossils held at three prestigious American museums? 3) What should be the concept of physical geography that would help ensure ethical research procedures? 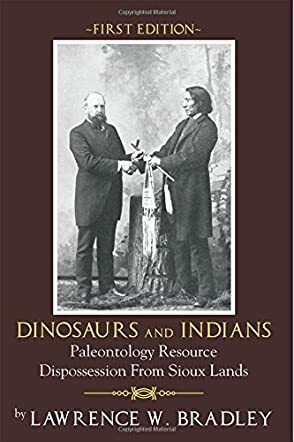 Dinosaurs and Indians: Paleontology Resource Dispossession from Sioux Lands by Lawrence W. Bradley reexamines how the paleontological resources have been dispossessed from Sioux lands and adjacent Indian lands since they were discovered over one hundred and fifty years ago, and puts forward the view that such resources need to be protected now and in the future. The author has used extensively as evidence: publications, autobiographies, biographies, eyewitness accounts, legal cases, maps, media reports, memoirs, museum visits, numerous examples of fossils, oral history, and Tribal Government and U.S. Government documents. This is truly a scholarly work. I welcome having had an opportunity to evaluate this as an excellent book.